These 25 poems are designed to assist any reader to connect with the divine within and without! 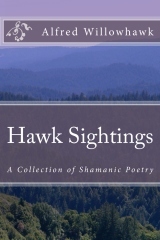 Hawk Sightings My Shamanic Poetry Collection. Designed to assist you in connecting to your Inner Shaman 25 poems each full of amazing imagery to tap your Shamanic Soul These poems are illustrated by renown artist Ziza – ( Will O’ Wellspring).